New students at the Ulster Sports Academy are taking part in a bespoke training session to help them adapt to studying at university. Entering their sports and exercise sciences and sports studies undergraduate programmes this week, the cohort of 150 students will be given a one-day course designed and facilitated by experts from Study Skills Zone. Already a well-established leader in the secondary school sector North and South of the border, Study Skills Zone is an independent company that aims to motivate and educate students in the skills and techniques needed to succeed in education and to achieve employability. Dr Katie Liston from the Ulster Sports Academy at the Jordanstown campus, said: “Our cumulative experience in the Ulster Sports Academy has shown us that level one students have particular educational needs associated with the transition to University and we believe in integrating this as part of their induction activities to kick start their studies”. Trained facilitators from the Study Skills team will return to the Academy in December to fine tune students' exam preparation and performance. Study Skills Zone Managing Director, Roisin McFeely, said the collaboration with the Ulster Sports Academy is a “real reflection of the commitment shown by the University of Ulster and the Sports Academy towards its students and we are delighted to work with them in partnership for the betterment of young people’s education”. 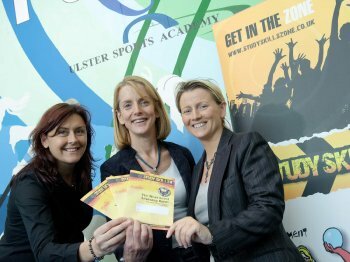 Caption: Left to right: Dr Katie Liston and Professor Marie Murphy from the Ulster Sports Academy and Roisin McFeely Managing Director of Study Skills Zone.